Prescription writing has to be properly addressed with regard to its correctness and appropriateness. Any errors in the procedure have to be eliminated. Electronic prescribing has abolished most of typographical prescription errors but the rationality involved in prescription of drugs is more of a thought process, which is still not optimum. Irrationality in prescriptions leads to medication errors causing increased morbidity or hospitalization and an economic loss. The rational use of medicines should be practiced which begins with defining the therapeutic objective, choosing the right medicine which is specific to the patient's needs, followed by monitoring of response to therapy. Compliance and outcome of therapy is totally dependent upon the doctor-patient relationship, a proper information and communication with the patient, and the physician's commitment and empathy towards the patient. Key Message: Technicalities of prescription writing have been addressed previously but rationality in prescription writing is also of prime concern. This review is an attempt to lay stress on the practice of the rational use of medicines in prescriptions. Morbidity occurring because of irrational and inappropriate prescriptions can be curbed with education and awareness of the prescriber. Prescription writing has often been addressed with regard to its correctness and appropriateness, higlighting the errors associated with it. Electronic prescribing has abolished most typographical prescription errors but the rationality involved in the prescription of drugs is more of a thought process, which is still not optimum. Irrationality and lack of knowledge regarding the art of prescription writing often leads to medication errors, causing increased morbidity or hospitalization and economic loss. The rational use of medicines should be practiced that begins with defining the therapeutic objective, choosing the right medicine which is specific to patient's needs, followed by monitoring of the response to therapy. The compliance and outcome of therapy is entirely dependent upon the doctor–patient relationship, the dissemination of proper information, an appropriate communication with patients, and the physicians' commitment and empathy toward their patients. The word “prescription” originates from the two words “pre-” (“before”) and “script” (“writing, written”) and refers to an order that must be written down before a drug can be dispensed. A prescription order is written for the diagnosis, prevention or treatment of a specific patient's disease. It is written by a licensed practitioner. It is written as part of a proper physician–patient relationship. It is a legal document, and may be used as prima facie evidence in a court of law. 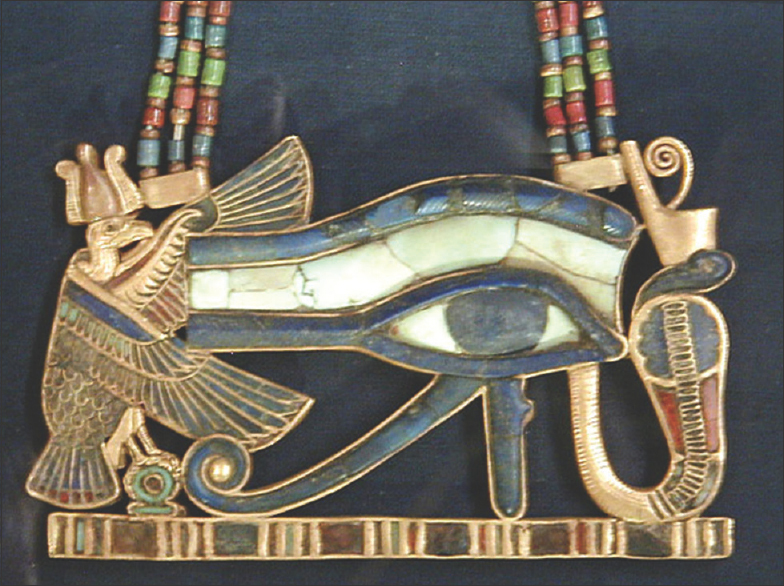 In the ancient era, the pharmaceutical industry was nonexistent. The compounds or medicines along with their appropriate amounts were mentioned by physicians on prescriptions, with instructions to pharmacists for dispensing the medicines in appropriate doses and amounts. Thankfully, this job of compounding and dispensing of medications has been taken up by the pharmaceutical industry. Presently, medicines along with their dose and duration of intake are directly mentioned on the prescription itself. Globally, medicines are dispensed by pharmacists as per the doctor's prescription. 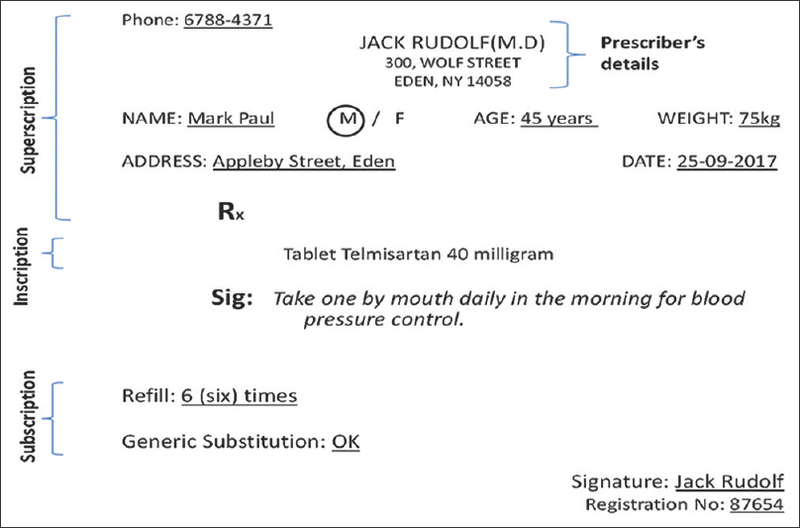 The individual sections on the prescription consists of the prescriber's details, the patient's details (name, age, gender, address), the superscription, the inscription, the subscription, and the signa [Figure 1]. The registration number of the doctor is clearly written and is an assurance for the patient that the prescriber is registered with a medical council. This reflects the authenticity of the doctor. Date: The inscription of date on the prescription is not only important for the patient but the prescriber and the pharmacist as well. With regard to the patient, it helps to ascertain the course of therapy, the timing of follow-up required, and it also serves the purpose of aiding as medico-legal evidence in the court of law. From the doctor's viewpoint, it indicates the compliance to treatment, helps in determining the validity of the prescription and in avoiding unnecessary redispensing of the medication described in the prescription. The pharmacist cannot identify an old prescription brought for redispensing of medication, if it is not dated. Last but not the least, prescription should be signed and dated. The onus lies on the prescriber for being responsible for the facts mentioned in the prescription. Hence, it is important to safeguard one's interest; the prescriber should be well acquainted with the art of writing a prescription. There is no margin for any error as a prescription directly deals with the patient's well-being and life. Monitoring of drug therapy: The prescriber should be able to explain to the patient the kinds of drug effects that need to be monitored. The patients should also be informed regarding the laboratory tests necessary at appropriate times, and the development of signs and symptoms of the disease or the medications administered that the patient should report. For illnesses that require a short course of therapy (e.g., most infections), the duration of treatment should be explained to the patient as he/she might erroneously assume that the medication is no longer needed because the bottle is empty or that symptomatic improvement has occurred. For a patient with a prolonged illness, e.g., bronchial asthma, the need for a prolonged therapy should be explained. The prescriber should also specify to the relatives of the patient to look for any changes in the patient's condition that might require a change in therapy. Major toxic reactions that require immediate attention should be explained to the patient. Patient education: The prescriber and other health-care professionals should be prepared to repeat, extend, and reinforce the information transmitted to the patient as often as is necessary. The more toxic the drug prescribed, the greater is the importance of this educational program. Informing and involving the patient in each of the above steps is mandatory. Prescription writing is not just putting some words on a piece of paper. A systematic and meticulous approach should be followed while writing a prescription. 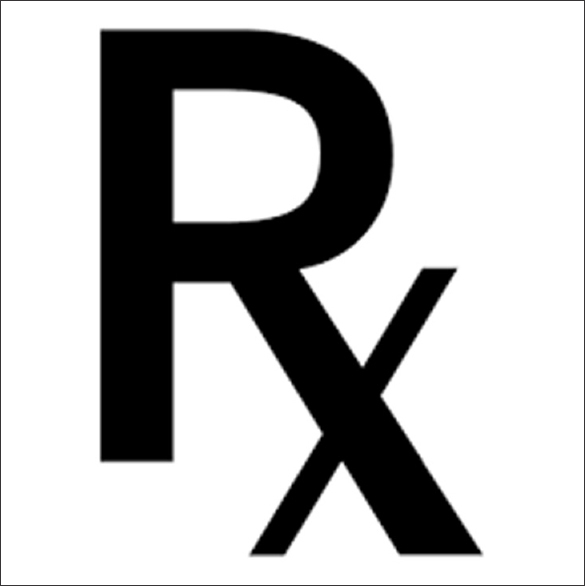 A prescription can be illegible, incomplete, and irrational. Illegible or unreadable drugs are the biggest challenges as they lead to a large number of prescription errors. It is the eighth leading cause of death in the United States with more than 98,000 people dying because of it annually. The National Patient Safety Agency revealed that medication errors in all care settings in the United Kingdom occurred in each stage of the medication treatment process, with 16% errors occurring in the prescribing, 18% in the dispensing, and 50% in the administration of drugs. In India, studies done in Uttarakhand and Karnataka have documented the medication errors rate in hospitalized patients to be as high as 25.7% and 15.34%, respectively. Incomplete prescriptions are prescription orders with missing or inappropriate information, that is, the dosage form, the route of administration, the dosing schedule, the duration of therapy, etc. Prescriptions without signature of the prescriber, a review advice, instructions to patients, refill instructions, etc., are also considered to be incomplete. This can lead to more of guess work on the part of both the pharmacist and the patient, which may lead to a fatal outcome. A rational prescribing is to be adopted where in the right drug is to be prescribed for the right diseases, for example, the usage of antibiotics in viral disorders, and the usage of irrational fixed dose combinations such as ciprofloxacin and metronidazole should be avoided. Many medication errors occur as a result of poor prescribing of medications and are due to the presence of ignorant medical staff members. The causes for medication errors can vary from a miscommunication between the physicians, patients, pharmacists, and other paramedical staff who are involved; the improper storage, labeling, packaging of medications; confusion regarding 'look-alike sound-alike' (LASA) drugs; lack of information on current pharamacological trends, protocols, dosing, references, and medicine formularies; and, the prevalent unawareness among the staff members regarding new medicines, narcotics, or high-alert medications. Other than this, causes of prescription errors include human factors such as excessive workload, fatigue, inexperience, lack of training, and poor handwriting; workplace factors such as poor lighting, noise, interruptions; pharmaceutical factors such as polypharmacy, confusing drug nomenclature, packaging or labeling, increased number or quantity of medicines per patient, and an increased frequency and complexity of calculations needed to prescribe, dispense, or administer a medicine; and, lack of standard operating procedures (SOPs). At the patient level, the individual's understanding of the prescriber's instructions and the level of compliance affect the outcome. An intellective communication on the part of prescriber in making the patient comprehend the prescription is again an important factor that is helpful in reducing prescription errors. Medication errors have a huge and an equal impact on the health-care system, the patients, and the personnel responsible for bearing the expenses of the medications. These errors compromise the confidence levels of patients on the health-care system that they are an integral part of. Teaching the art of prescription writing to undergraduate students is essential. This practice should be a part of their teaching curriculum. Poor understanding of instructions of the prescriber may also be an important factor. The patient who is likely to discontinue a medication because of a perceived drug-related problem should receive instructions on how to monitor and understand the effects of the medication. Compliance can often be improved by enlisting the patient's active participation in the treatment. Repeated reassurance and the prescriber's faith in the therapy should be inculcated in the patient. Many eventualities leading to morbidity and mortality can be prevented by adhering to good prescribing practices. Adopting the rational use of medicines and practicing evidence based medicine will benefit both the patient and the society. De Vries TP, Henning RH, Hogerzeil HV, Fresle DA. 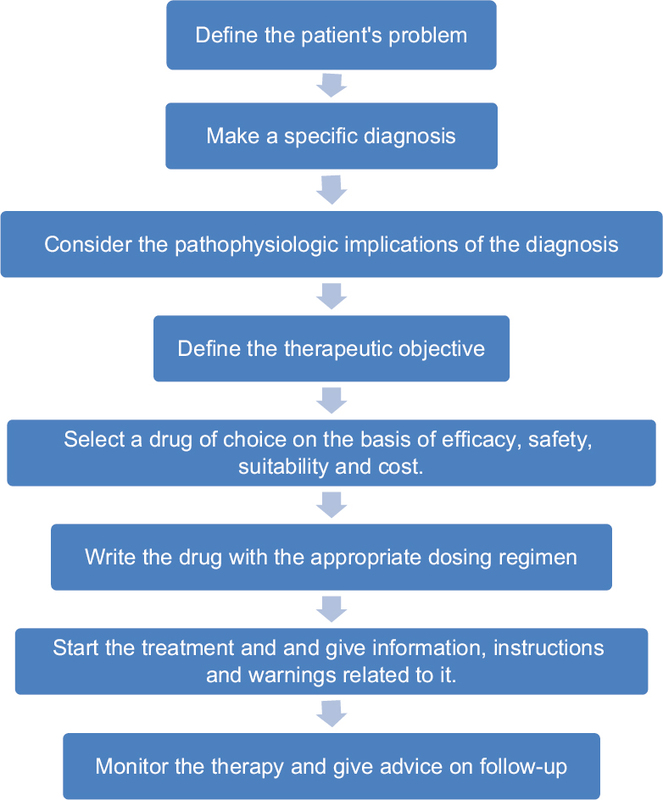 Guide to good prescribing: A practical manual. World Health Organization, Geneva. 1994. Available from: http://apps.who.int/medicinedocs/en/d/Jwhozip23e. [Last cited on 2018 Apr 09]. Katzung BG, Masters SB, Trevor AJ. Basic and Clinical Pharmacology. 12th ed. New Delhi: Tata McGraw Hill; 2012. pp 1039-48. Björnsson ES. 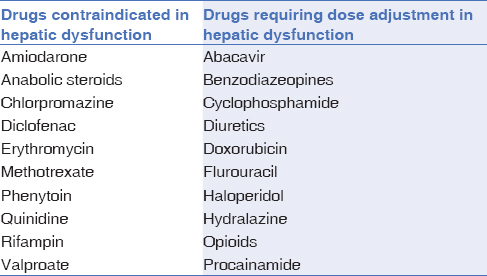 Hepatotoxicity by drugs: The most common implicated agents. Int J Mol Sci 2016;17:224. Munar MY, Singh H. Drug dosing adjustments in patients with chronic kidney disease. Am Fam Physician 2007;75:1487-96. Dhodi DK, Bhagat SB, Pathak D, Patel SB. 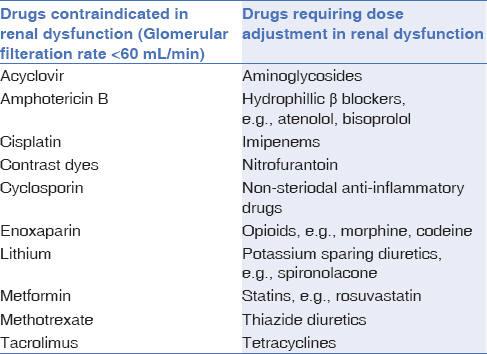 Drug-induced nephrotoxicity. Int J Basic Clin Pharmacol 2014;3:591-7. Burkey BW, Holmes AP. Evaluating medication use in pregnancy and lactation: What every pharmacist should know. J Pediatr Pharmacol Ther 2013;18:247-58. 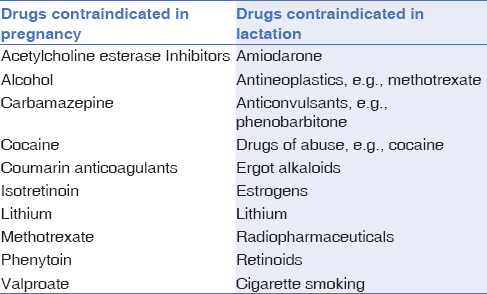 Moretti ME, Lee A, Ito S. Which drugs are contraindicated during breastfeeding? Practice guidelines. Can Fam Physician 2000;46:1753-7. Kalra B. Cytochrome P450 enzyme isoforms and their therapeutic implications: An update. Indian J Med Sci 2007;61:102. Salmasi S, Khan TM, Hong YH, Ming LC, Wong TW. Medication errors in the Southeast Asian countries: A systematic review. PLoS One 2015;10:e0136545. Alsulami Z, Conroy S, Choonara I. Medication errors in the Middle East countries: A systematic review of the literature. Eur J Clin Pharmacol 2013;69:995-1008. Patel N, Desai M, Shah S, Patel P, Gandhi A. A study of medication errors in a tertiary care hospital. Perspectives Clin Res 2016;7:168-73. Karthikeyan M, Balasubramanian T, Khaleel MI, Sahl M, Rashifa P. A systematic review on medication errors. Int J Drug Dev Res 2015;7. Laing R, Hogerzeil H, RossDegnan D. Ten recommendations to improve use of medicines in developing countries. Health Policy Plan 2001;16:13-20. Samsiah A, Othman N, Jamshed S, Hassali MA, Wan-Mohaina WM. Medication errors reported to the National Medication Error Reporting System in Malaysia: A 4-year retrospective review (2009 to 2012). Eur J Clin Pharmacol 2016;72:1515-24.